This black and white birthday card (for my favorite police officer) was simple to put together and looks pretty elegant, if I do say so myself! One stamp, two colors of card stock and a little ribbon go a long way to set on to of this lovely polka dot-embossed base. I stamped the sentiment and then cut out just the inside using the Mini Treat Bags Thinlit that matches this shape. I set it on a strip of Whisper White card stock that was also stamped with the same stamp, but I popped it up on Stampin' Dimensionals to make it look extra special. Thanks for looking today and I hope you have a great day! 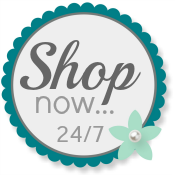 Won't you use my Online Store when you are ready to purchase your own Stampin' Up! supplies? Thank you!